“Alesi,” (a) anterior view, (b) superior view, (c) inferior view, (d) left lateral view, (e-h) 3-D visualizations based on X-ray microtomography, showing key aspects of the unerupted permanent tooth crowns, (grey) and bony labyrinths (green) that help classify this find. 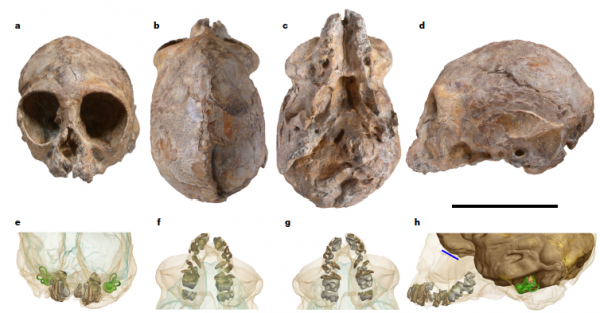 Discovered in 2014 and published this August in the journal Nature, the infant ape cranium, (approximately lemon-sized) has been dated to approximately 13 million years ago, landing the specimen within a critical time-period. The Miocene saw hominoids undergoing substantial evolutionary radiation- upwards of 40 distinct species across 30 genera have been identified from that era, but little is known about how arguably the most important and distinct feature of the hominids, the cranium, evolved, due to the lack of surviving specimens. In particular, the African record lacked any reasonably informative hominoid cranial specimens from between 17 and 7 million years ago. With the type of serendipity that seems to accompany many literature- (and life)-altering finds, Nengo describes returning to camp with his team for dinner after a disappointing day of finding nothing at their Kenyan site. An assistant, John Ekusi, happened to pull out a cigarette, but was shooed away from the rest of the group…where he happened to see something in the dirt. Nengo’s team ascribes the infant to the Nyanzapithecus genus, which resides within the catarrhines (the branch of the simiiformes that includes the old-world monkeys and apes). The Nyanzapithecus were long-lived, diverse Miocene hominoids who first appear in the fossil record in Africa’s late Oligocene (approximately 25 million years ago) until the late Miocene (approximately 6 million years ago), They’ve been known from isolated dental fragments since Harrison’s 1986 publication, however Nengo’s find cements the genus with by far the most substantial cranial data. These data allowed Nengo’s team clarify the genus’s phylogenetic relationships with a far more comprehensive character evaluation than the previously known dental fragments allowed. 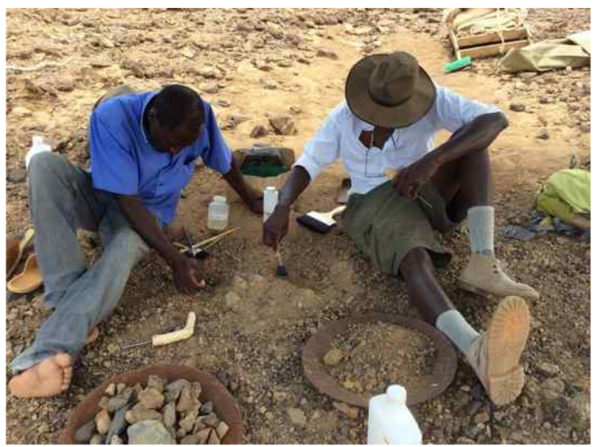 Nengo’s team’s research was supported by the San Francisco-based Leakey Foundation, founded to “increase scientific knowledge, education, and public understanding of human origins, evolution, behavior, and survival.” This is particularly fitting, as it was the great paleoanthropologist Richard Leakey who first inspired Nengo, a native of Kenya, to pursue a career in paleoanthropology.